Agora Gallery - Are you visiting Chelsea, NYS soon? 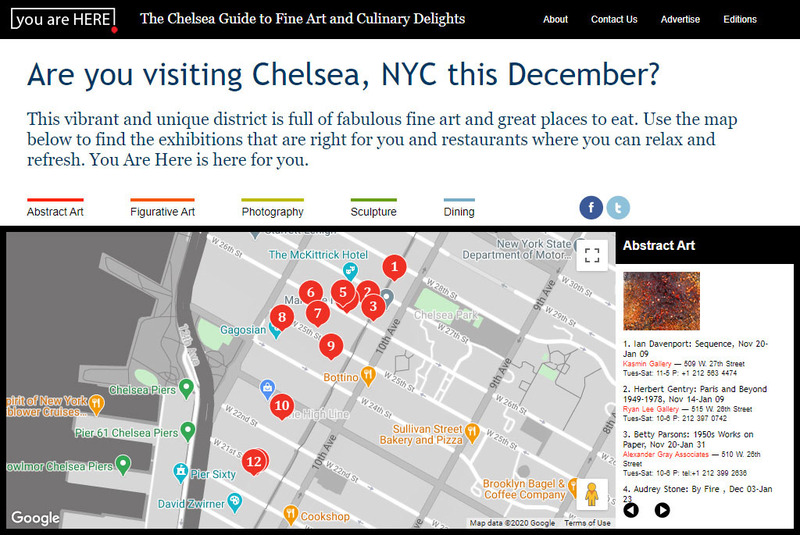 Agora Gallery's you are HERE Guide is a great way to make the most of your time in Chelsea. The site makes it easy to see where you are in the neighborhood and provides carefully designed themed walking tours of the art galleries that have made Chelsea famous throughout the world. With information about exhibition openings, receptions, and the special events scheduled to take place in the area, you can see what’s on and where it’s happening, as well as work out how to get there. Find all the information you need for a fabulous day out in Chelsea, all in one place! Copyright & Disclaimer - © 1984-2019 Agora Gallery, All Rights Reserved This site is currently in the process of becoming ADA compliant.